“This is history being made.” The Prime Minister outlined the Terms of Reference and named the six commissioners appointed to the Royal Commission today. The Terms of Reference are embodied in the Letters Patent. We are very pleased to announce that on our advice the Governor-General has now appointed six Commissioners for the Royal Commission into institutional responses to child sexual abuse. We have also today released the Terms of Reference that will guide their inquiry. The Commissioners have been selected because of their broad skills, knowledge and expertise. The Royal Commission will be led by Justice Peter McClellan AM, a Supreme Court Judge from New South Wales who brings a wealth of experience as a Judge and as an inquirer. Justice McClellan has been the Chief Judge at Common Law of the Supreme Court of New South Wales since 2005. He has also been Chief Judge of the Land and Environment Court of New South Wales, Chairman of the Sydney Water Inquiry and Assistant Commissioner at the Independent Commission Against Corruption. Justice Jennifer Coate has served for twenty years as a magistrate and county court judge in Victoria, including five years as President of the Children’s Court and five years as the Victorian Coroner. Justice Coate has also now been appointed to the Family Court of Australia. Robert Fitzgerald has served as a Commissioner in the Productivity Commission since 2004. He has experience in commerce, law, public policy and community services, including as Community and Disability Services Commissioner and Deputy Ombudsman in New South Wales. Professor Helen Milroy is a Director of the Centre for Aboriginal Medical and Dental Health at the University of Western Australia and a Consultant Child and Adolescent Psychiatrist with the Specialist Aboriginal Mental Health Service. She brings extensive experience in child and adolescent mental health and Aboriginal health and mental health. Former Senator for Western Australia Andrew Murray brings a tremendous background as a legislator and as a campaigner for those who have spent time in institutional care as children. We have asked the Commissioners to submit an initial report by June 2014, so that we can start acting on early recommendations as quickly as possible. We have asked the Commissioners to aim to finish their inquiry by the end of 2015, but this date will be subject to advice from the Commissioners in their interim report. The Commissioners will now work on setting up processes for hearing and collecting evidence, including arrangements for people who have special needs. They will also consider what services are needed to support witnesses to the Commission. And in doing so, they will be informed by the experiences of survivors. An investigative unit within the Royal Commission will ensure the timely referral and criminal investigation of allegations of child sexual abuse that come before the Commission, should victims seek such action. We received input from more than 800 individuals and organisations on the terms of reference, which has been invaluable in helping shape the scope of the Royal Commission and in selecting Commissioners. We also worked closely with the state and territory governments in developing the Terms of Reference, and we are pleased that they all support this inquiry. The Government is committed to do everything we can to make sure that we fix the system for the future. We also want to help survivors of past abuse receive support and justice. You will find attached an explanation of the Terms of Reference, a general fact sheet on royal commissions and their powers, and a list of support services. The full Terms of Reference are contained in Letters Patent, which are the formal instructions from the Governor-General to the Commissioners. it happens in any other circumstances where you consider that an institution is, or should be treated as being, responsible for adults having contact with children. any other person who you consider is, or should be treated as if the person were, an official of the institution. authorise you to submit to Our Governor-General any additional interim reports that you consider appropriate. 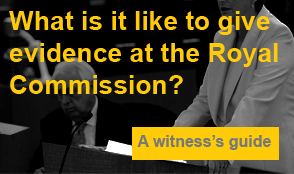 Commonwealth Royal Commissions are public inquiries that are established under Royal Commissions Act 1902 (Cth) by appointing Commissioners to conduct an inquiry in accordance with Terms of Reference approved by the Governor-General. In this case the Royal Commission is also expected to be established under relevant State legislation in several jurisdictions. This will allow the Royal Commissioners to act in multiple capacities, performing functions under Commonwealth and State laws. Royal Commission can refer information about suspected or alleged crimes to relevant law enforcement authorities or share relevant information with other ongoing inquiries. Information about hearings and how individuals can participate in the Royal Commission will be made available on its website www.childabuseroyalcommission.gov.au. If summoned, there are very few grounds on which a person can refuse to give evidence to a Royal Commission. Failure to comply with a summons issued by a Royal Commission may result in an individual receiving a fine or in some circumstances imprisonment. This document explains the Letters Patent and Terms of Reference for the Royal Commission into Institutional Responses to Child Sexual Abuse. The ‘Letters Patent’ is the legal document from the Governor-General that gives instructions to the Commissioners about the scope of the inquiry and what the Commissioners should investigate and make recommendations on. The Letters Patent also formally appoint the Commissioners. The full Letters Patent document is available at www.childabuseroyalcommission.gov.au. This explanation document should not be taken to in any way replace the Letters Patent document, or to have any legal standing. Child sexual abuse is often associated with other forms of abuse including physical abuse, exploitation, and neglect. Australia has committed at an international level to do everything it can to protect children from all forms of abuse. This includes taking action to help prevent child abuse from happening and, when child abuse does happen, to help ensure that cases are identified, reported, investigated, and followed up. It is recognised that public, non-government and private organisations provide important services and support to help children and their families. These include childcare, cultural, educational, religious, sporting and other organisations, which play an important role in helping children to grow up safe and happy. But it is important that laws, rules and practices are in place to ensure organisations protect children against the risk of sexual abuse and that claims of abuse and the impacts of abuse are appropriately responded to. It is important that this inquiry explore claims of systemic failures by institutions to protect children from sexual abuse and related matters. The inquiry should identify what can be done in the future to better prevent and respond to child sexual abuse, including holding perpetrators to account and providing justice to victims. People who have been affected by child sexual abuse will be able to share their experiences with the inquiry if they want to, to assist with healing and to inform the Commissioners’ recommendations. The Australian and State and Territory Governments have committed at the most recent Council of Australian Governments meeting to support this inquiry, and giving it their full cooperation. what organisations should do to ensure victims receive justice, including through redress by organisations, and investigation and prosecution of perpetrators. The Commissioners can make any recommendations that they think will help improve the way things are done in the future or help existing survivors. This includes looking at laws, as well as the policies, rules and structure of organisations. The Royal Commission is focused on child sexual abuse within organisations and institutions. The Commission will also look at matters related to child sexual abuse. This means any unlawful or improper treatment of children that is connected or associated with child sexual abuse generally, or in a particular case. This recognises that other forms of abuse including physical abuse and neglect often happen with sexual abuse, and if connected they can be examined by the Commission. The Commissioners can look at any public or private organisation that is, or was in the past, involved with children, including non-government organisations and government agencies (including police and justice), schools, sporting clubs, orphanages, foster care, and religious organisations. take into account the findings, recommendations, and information from past and existing inquiries, where appropriate. This can include drawing on the stories of witnesses from other inquiries (with their consent). The Commissioners will make sure that people telling their stories have appropriate support in dealing with any trauma that might come up from discussing their abuse. The Commissioners will also make sure that people with special needs can participate fully in the inquiry. For example, this could include interpreters for people who speak a language other than English, assistance for people with disabilities, and help preparing submissions for people who need assistance with reading and writing. The Commission will make sure that organisations are given enough time to search and respond to requests for documents and records. The Royal Commission cannot prosecute individuals. The Commission can refer individual cases to relevant law enforcement bodies, such as police, for investigation and, where appropriate, prosecution in a timely fashion. The Commissioners will consider appropriate mechanisms for how the Commission might inquire into and investigate particular cases, including past cases, as appropriate. Mechanisms might include examining archives and records and working with relevant law enforcement bodies such as police. This includes establishing investigative units to support their inquiry. In handling evidence about specific cases, the Commissioners will take care not to do anything that could disrupt a current or future criminal prosecution or compensation case. The Commissioners will begin their inquiry as soon as possible. The Commission will prepare an interim report by 30 June 2014 so that governments and organisations can start taking action on the Commission’s early findings and recommendations. In this interim report, the Commissioners will identify when their final report will be completed. The Terms of Reference will set an end date for the Royal Commission of 2015, but this date will be subject to the advice of the Commissioners in their interim report. The Prime Minister can extend the final reporting date which has happened in previous Commissions. The Commissioners will also be able to provide other interim reports throughout the life of the Royal Commission as appropriate. The Royal Commission will soon start its work. If you need support or advice, a list of services you can contact is below. Child abuse is a crime. If you have been a victim of abuse, or are concerned about a child being abused, this should be reported to police. The Royal Commission cannot prosecute individuals. People wanting to provide evidence or find out more information about the Royal Commission can provide their contact details on 1800 099 340. Staff from the Royal Commission will make contact once the Commissioners begin their work. For more information on the Royal Commission go to www.childabuseroyalcommission.gov.au.